Set in the green splendour of the Cévénol Piémont, Château de Valfons has been looking out over the Crespenon valley since the Middle Ages. Its history is something of a mystery. Queen Blanche of Castille (1188-1252) is said to have stayed there at one point... Twice burnt down in the 15th and 18th centuries, our ancestors restored it and turned it into a summer residence in the 1880’s. 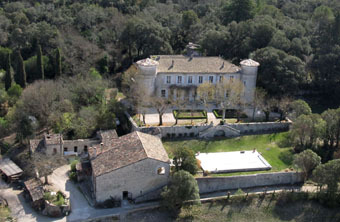 The Château is protected from inquisitive eyes by 200 hectares (500 acres) of woodland and heath. The prevailing peace is occasionally interrupted by cicada song, the murmur of wind in the trees surrounding the terraces or a horse whinnying in a nearby field. As the day draws to a close, the windows reflect the sinking sun, setting the front of the house aglow. Time comes to a halt. The setting sun sets the Cévenne Mountains ablaze, a magical, breath-taking vista to be enjoyed over and over again from the terraces. Having enjoyed so many wonderful moments here as a family, we would be happy to welcome you to Valfons as Lords and Ladies of the Manor for a day. Château de Valfons’ authenticity and charm, its romantic surroundings and terraces with their breath-taking panorama make this family property an exceptional location for entertaining. The gardens can accommodate up to 350 guests for a cocktail and 200 for a sit-down meal. We do not provide catering services. Neither do we provide accommodation but there are plenty of options nearby. Fabrice Teissedre and his staff will help you organise your entertainment to suit the occasion.